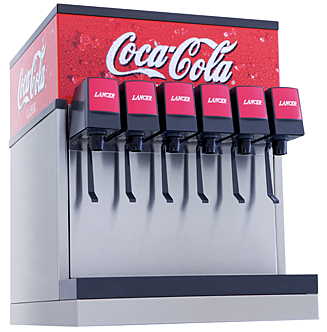 Counter Electric Dispensers are available in many configurations. These are an electrically cooled water bath units that have chilling coils for soda, syrups and water. 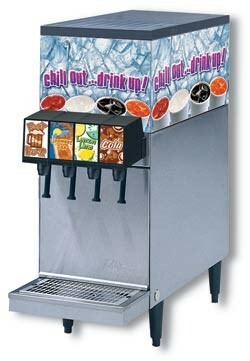 Products flow through and get chilled to feed the post mix dispensing valves for immediate consumption. The Counter Electric Dispensers are primarily available in 3, 4, 5, 6, 8, or 10 Valve dispensers. They also have many different cabinet sizes depending on refrigeration needs and usage. They can be Id’ed with many different custom graphics and cooling unit can be reversed if needed to install for proper air flow. Counter Electric dispensers are the perfect machine when no ice is available since drinks are always cold and ready to consume. They can also have a key lock installed to shut down the valve operation while refrigeration is still operational. Please note that these dispensers require back end of post mix system to operate.